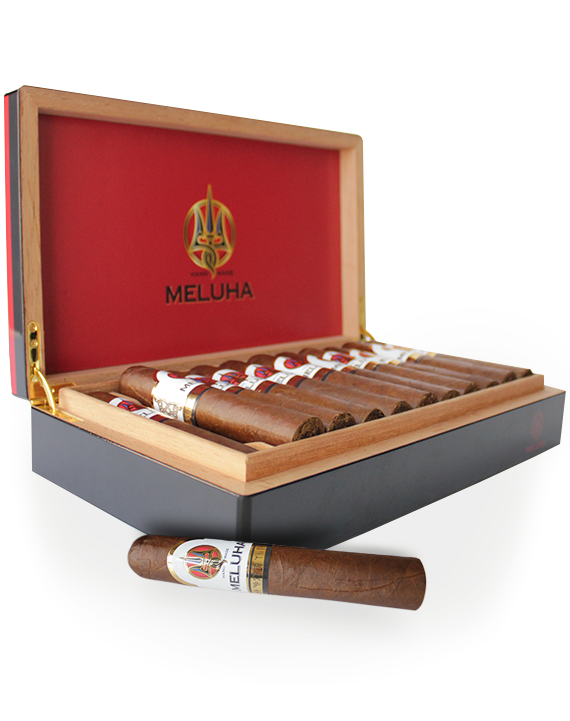 Meluha cigars are a reference to the Ancient Eastern mythological place, ‘Meluha’, literally meaning ‘Land of the Pure’. Each component of a Meluha cigar stays true to its name. The leaf, the tobacco and the very hands that crafted it are the finest of its kind. We believe so strongly in the spiritual uplifting and purity of our cigars that we follow a powerful Meluha Mantra. A mantra that has been inscribed on every cigar paper ring. It is a powerful ethos derived from the traditional Hawaiian philosophy of ‘Ho’oponopono’, a process of self-identity, meditation, and ultimately, self-surrender. Each Meluha cigar calls Costa Rica home, where it has been meticulously hand-made and rolled. The innermost layers are made up of premium Cubanos leaves whilst the outer wrapper is a Maduro leaf, specially grown and sourced for Meluha cigars from the Dominican Republic. The journey of a Meluha cigar runs over seven to nine years and begins with a selection and cultivation of the best tobacco Cubano seeds. The selected few are implanted onto rich soil in Costa Rican fields by our expert farmers. With just the right exposure to the sun and rain, the seeds grow into lush tobacco plants bearing leaves that will become a part of history. Soon enough the season for harvesting begins and the first rituals of cigar making are about to take place. After months of attentive care and careful nursing, the tobacco leaves are ready to be picked. Beginning with the bottom of the plant and moving to the top, the leaves are picked over the course of several weeks, according to size, colour and response to touch. Once picked, these leaves are taken to our temperature- and humidity-controlled curing barn to dry for another two to three months under the watchful attention of our experts. It is here that the once verdant green leaves will turn a dark brown and take on the characteristics that make Meluha cigars so unique. Soon the leaves are ready to be fermented in a fermenting house with a carefully controlled temperature. Over the next few months, they will also develop the unique flavour that makes them Meluha leaves. They then make their way to a sorting room where expert handlers set apart the filler leaves according to colour and size and strip off their veins. Soon after, they are sent for another period of fermentation where the flavours mellow out. When the leaves are ready a few months later, our expert rollers, or torcedores, bring them together for the final treatment. The leaves are bunched, pressed and finally rolled around the tobacco in a lengthy and specialized process. Our torcedores have spent years learning the craft and perfecting the rolling method. However, where an average torcedore can make up to 100 cigars a day, our craftsmen are trained to make only 50. A slower and more precise method has ensured that every Meluha cigar has perfectly balanced flavours and the power to bring the smoker to an exquisite surrender. A delicate Dominican wrapper leaf then covers each cigar and is ringed with the signature Meluha band. We now hold in our hands a work of art. A treasured piece of good taste that began with a farmer’s practiced care and ended with the beautiful artistry of the torcedore. With a quality that has no counterpart and an aura that leaves the smoker with an indelible longing for more, a Meluha cigar is a practice in sheer artistry. From a farmer’s caring watch to the experienced motions of the tobacco picker. From the drying barn and fermentation room to the final rolling station. A Meluha cigar’s leaves go through many skilled hands before they become a true masterpiece. An exceptionally large ring gauge, 66 to be precise. For greater pleasure, longer burning time and an escape that is intensely enjoyable. Meluha cigars are aged much longer than you would expect, taking anywhere from seven to nine years to reach your hands. Because being unconventional has made them unforgettable. The seeds, tobacco plants and, finally, the leaves have all been generously endowed with such careful attention that every cigar blend can provide a completely pure smoking experience. Bold, dark and supremely mysterious, the leaves that make a Meluha cigar offer a meditative trance with just as much depth. A rich, earthy aroma balanced with a spicy aftertaste. Each waft gives a hint of a cigar that is steeped in an aura of luxury.